Wexford can book their place in the All-Ireland hurling quarter-finals with a win over Waterford tomorrow. Liam Ryan has been a regular feature in the Wexford senior team this summer. KILKENNY CAPTAIN LESTER RYAN has two good reasons to keep an eye on Wexford this weekend. After shocking champions Clare, Liam Dunne’s side are still in the mix to join the Cats and Cork in the All-Ireland semi-finals. To do that, they will have to first beat Waterford in Nowlan Park tomorrow and then safely negotiate a quarter-final against Limerick on 27 July. As well as doing some opposition scouting, Ryan will be watching out for his cousin — rising star Liam Ryan. The Raparees defender is one of Wexford’s most promising talents and helped the county to their second straight Leinster U21 title earlier this month. “He’s my second cousin,” Ryan explained. I met him there last year. I think he must be living in the gym — he’s gotten fierce big! Last year or the year before he was a minor and now he looks older than me. “He’s making great ground and he’s a brilliant player. It’s enjoyable watching Wexford and seeing him playing, and it was great for them to get over [Clare]. “Obviously the Ryan family were delighted for him down there,” he added, joking: “I think there’s Kilkenny blood in him even if he doesn’t say it. 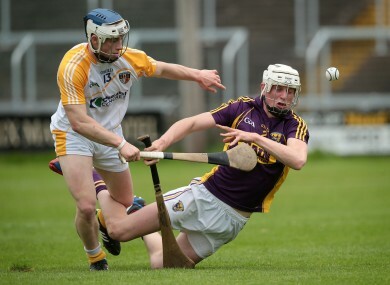 The younger Ryan cousin is one of four players who have juggled a hectic few weeks with Wexford’s two senior games against Clare falling either side of their Leinster U21 decider. Their progress at underage and at senior level has emerged as another challenge to Kilkenny’s long-standing dominance in Leinster, Lester Ryan said. “It is becoming more competitive and it’s great to see Wexford coming through so strong. Unfortunately they’re after winning two U21s and two defeats for our U21s with it, so it’s definitely becoming more competitive. You just have to look at their U21 team, and the same with Dublin. A year older and a year wiser – are Meath finally ready to take down the Dubs? Email “'He must be living in the gym' - Kilkenny captain Lester Ryan is keeping tabs on his Wexford cousin”. Feedback on “'He must be living in the gym' - Kilkenny captain Lester Ryan is keeping tabs on his Wexford cousin”.